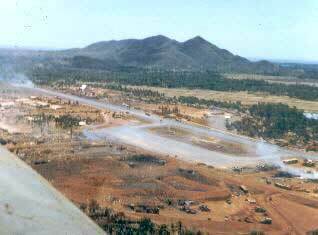 As summer approached, the 2/5 Cavalry continued its participation in Operation Pershing in Eastern Binh Dinh Province. The Communists' organization and command structure in the province had been disrupted during the preceding three months and the enemy was attempting to infiltrate troops into the coastal plains in an effort to regain strength and control over the many hamlets and villages. 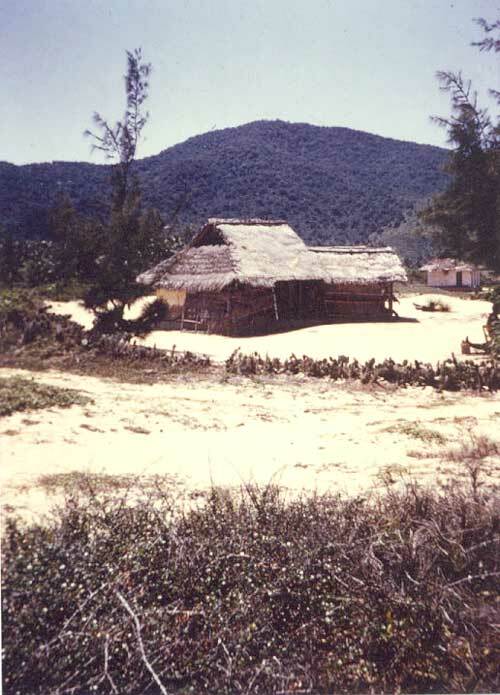 Since the civilian population of the mountain valleys had been evacuated and resettled, the lowland rice-growing areas near the coast became even more important to the VC and NVA soldiers; they had no other easy source of food supplies. 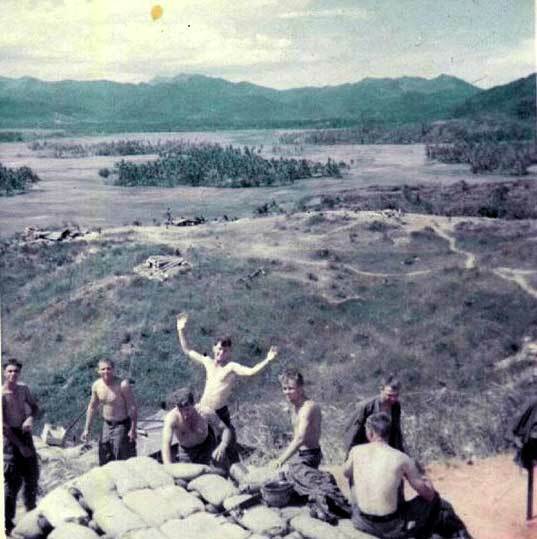 C Company's usual daily operations during May consisted of surrounding and searching villages in The Crescent, the flatlands in the vicinity of Dam Tra O (lake). This was a rich agricultural area of rice paddies, with the large fresh-water lake and the nearby sea providing substantial additional resources. Infiltrators entered the area both from the western mountains and by sea. 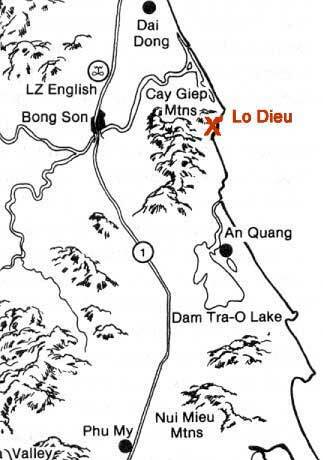 The Viet Cong attempted to blend into the legitimate populace of the many hamlets while the NVA troops generally seemed to stay in the two mountain groups; the Cay Giep to the north of The Crescent and the Nui Mieu to the south. C 2/5th Cav made another first by making a night amphibious landing. Using landing vessels of the 1098th Boat Company, 1st Logistics Command, Qui Nhon, the mission was to board the boats at night and move by water to a village complex along the coast of the South China Sea. 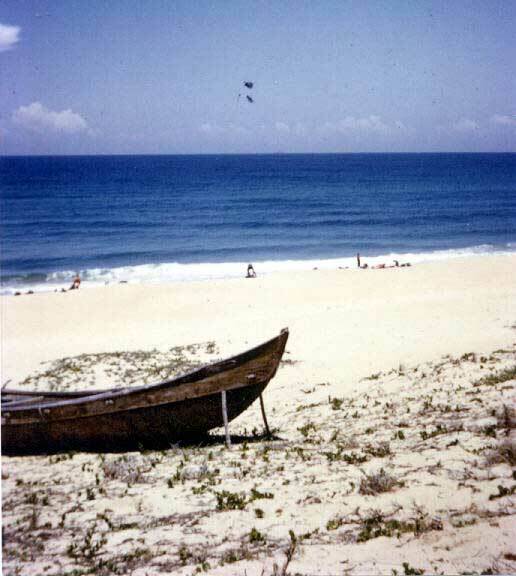 An amphibious landing was necessary because arms of the Cay Giep mountains came down to the sea, making it difficult to approach overland. C 2/5 Cav was given the mission to make a night landing, then cordon and sweep the village of Lo Dieu (BR 970950, Map 6837-4). The company met the landing craft late in the evening on the beach southeast of Dam Tra O Lake. C 2/5 Cav's amphibious landings were one of the front page stories in this issue of Blackhorse Hoofbeats. Be sure to read it as it contains some interesting information. Be aware the full story may take awhile to download. Memorial Day - - that day every year when we remember buddies who died in combat. This special memorial bulletin, issued by the 2nd Brigade, honored those from the 1/5th, 2/5th, and 2/12th Cav who were KIA from May 1966 to May 1967. This is a typical village in the Bong Son Plains. 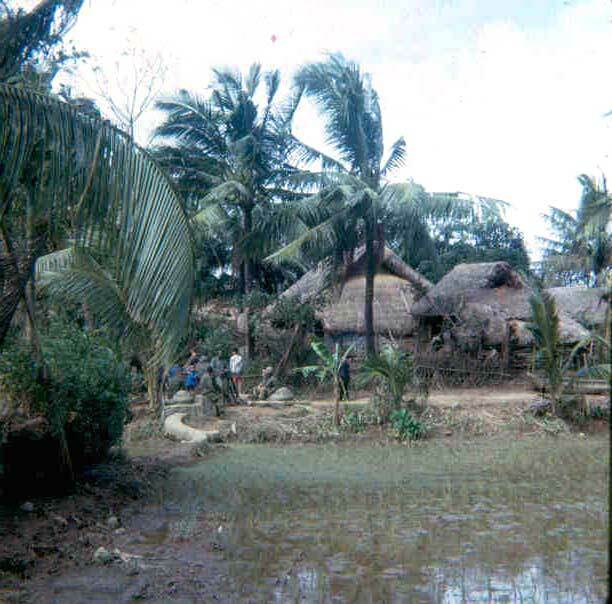 The houses (known as a hootch to most grunts) were built right next to the rice paddies. In this case, the rice plants have been recently planted and will grow into mature plants in a few months. Note the troopers of Charlie Company taking a break, with the ever-present kids with them. 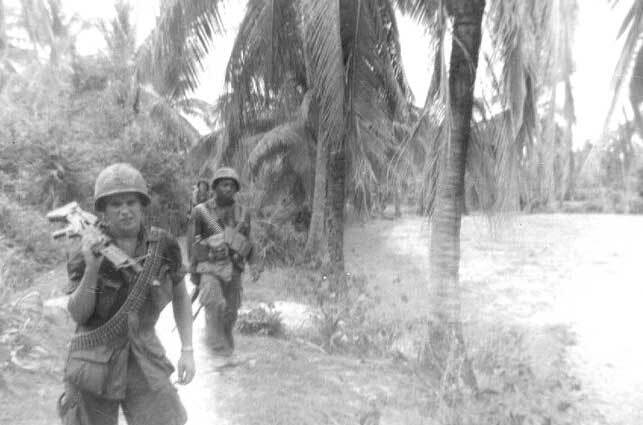 1st Platoon machine gunner Norman Ford trudging down a trail used by villagers to get to their fields. Behind him is assistant gunner Leonard Dixon. Note they are far apart - distance reduces casualties when the shooting starts. Another of 1st Platoon's machine gun crews. 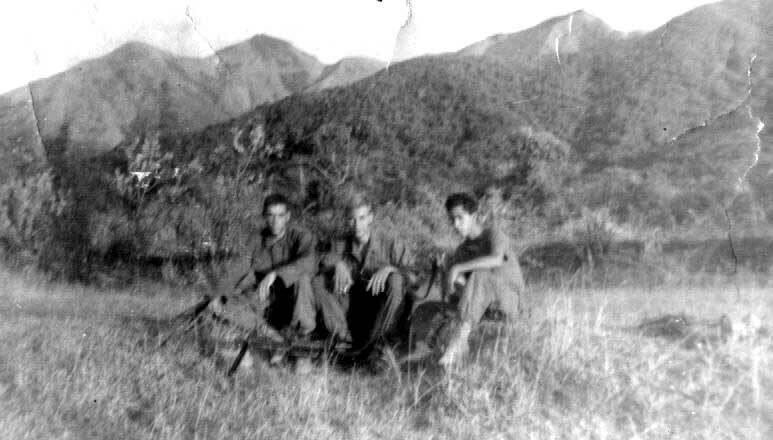 From left to right: Anthony Drames, Anthony "Tony Vic" Vicinanza, and Anistacio Hudley. Dave Mason flew Hooks for the 196th Assault Support Helicopter Company from LZ English. Even though his was not a Cav unit, they flew support for us. Dave sent this picture of LZ English from the air. 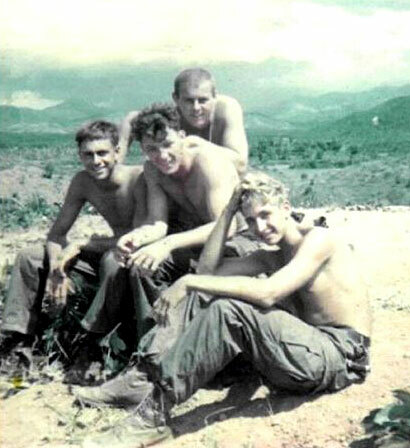 Near right: Tom Blancett, Thomas Wall, Robert Plew (Standing), and Anthony "Tony Vic" Vicinanza. Far right: From left to right Tom Blancett, Robert Plew, Tom Walls (with hands raised), Norman Ford (entering bunker). The names of the others are unknown. If you can identify the others, please let the webmaster know.